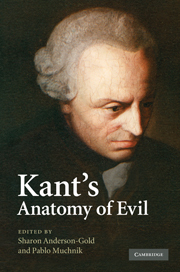 Kant infamously claimed that all human beings, without exception, are evil by nature. This collection of essays critically examines and elucidates what he must have meant by this indictment. It shows the role which evil plays in his overall philosophical project and analyses its relation to individual autonomy. Furthermore, it explores the relevance of Kant's views for understanding contemporary questions such as crimes against humanity and moral reconstruction. Leading scholars in the field engage a wide range of sources from which a distinctly Kantian theory of evil emerges, both subtle and robust, and capable of shedding light on the complex dynamics of human immorality. Introduction; 1. Kant's 'Metaphysics of Permanent Rupture': radical evil and the unity of reason Philip Rossi; 2. Kantian moral pessimism Patrick Frierson; 3. Kant, the Bible, and the recovery from radical evil Gordon Michalson; 4. Kant's moral excluded middle Claudia Card; 5. Evil everywhere: the ordinariness of Kantian radical evil Robert Louden; 6. An alternative proof of the universal propensity to evil Pablo Muchnik; 7. Kant and the intelligibility of evil Allen Wood; 8. Social dimensions of Immanuel Kant's 'Conception of Radical Evil' Jeanine Grenberg; 9. Kant, radical evil, and crimes against humanity Sharon Anderson-Gold; 10. Revolution and reconciliation: toward a Kantian account David Sussman. "... Kant's Anatomy of Evil resoundingly succeeds in showing the depth of Kant's resources for dealing with the problem of moral evil. Anyone with a professional interest in Kant's practical philosophy should read it."